This year Easter falls on April 21, while some traditions have been passed to the Untied States over the generations, such as chocolate eggs and Easter baskets, each region in Italy herolds traditions of their own. 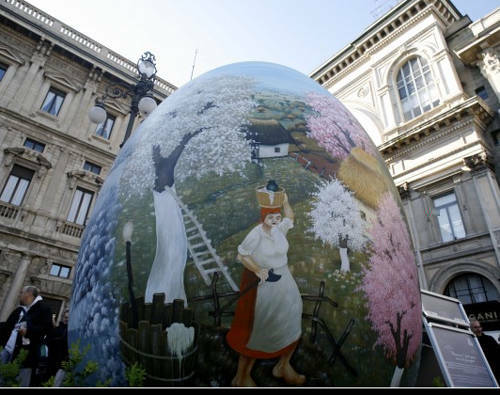 Since Italy is one of the most Catholic countries in the world, Easter is traditionally celebrated in a big way. Keep reading to find some of Italy's most exciting celebrations. Spring into Lombardy’s capitol for a cultural experience. Milan is known for cherishing ages of art through its reputable museums and galleries. Start your Easter week off by visiting Leonardo DaVinci’s “The Last Supper” in Santa Maria delle Grazie. Make sure to get tickets in advance; each reveler is allotted just 15 minutes to marvel at the masterpiece before being escorted from the former Domenican Monastery. The tradition of the “Colomba di Pasqua” originated in Milan and became a fundamental tradition in households all around Italy. It is a dove shaped cake with a similar consistancy to Panettone with flavors of almond and a sweet outter coating. Though Venice has a huge production of parades and festivals for Carnivale, Easter is much more contained. Most Venetians are busy at work on Friday and shops and markets remain open on Saturday. Throughout Sunday bells chime through the city from the ancient clock towers that make Venice so picturesque and celebrate the Resurrection of Christ. Delicious chocolate Easter eggs, a tradition that has internationally commercialized the Easter season, are unwrapped from their cellophane and devoured by the young ones. People give gifts, enjoy lamb with artichokes, and spend time with each other in springtime bliss. Trieste is filled with incredible Orthodox churches that create the perfect ambiance for an Easter weekend; the beautiful scenery of downtown Trieste is also a plus. 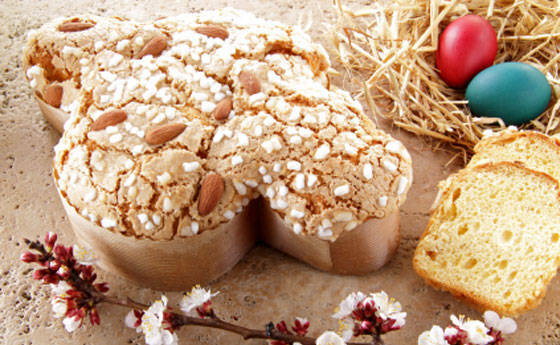 Make sure to munch on Pinza Pasquale; a native dish to the area and a traditional Easter must try. 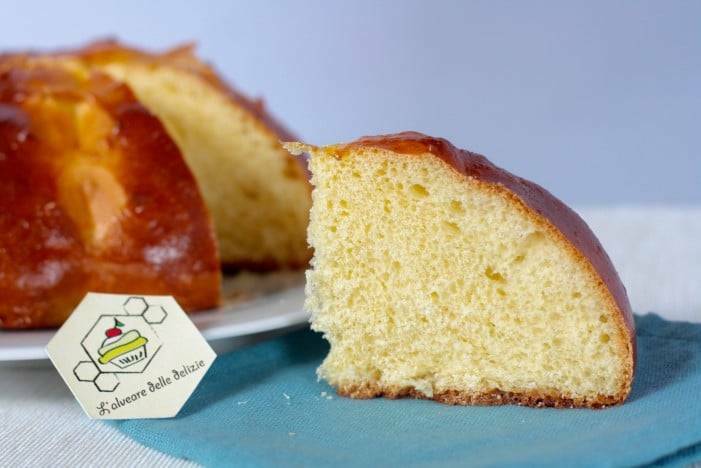 The sweat treat is a mix between a cake and bread; its fluffy buttery texture is complimented by its simple sweet flavor and topped with the shape of a cross. The panoramic views and unforgettable shopping make for the perfect springtime seaside getaway. 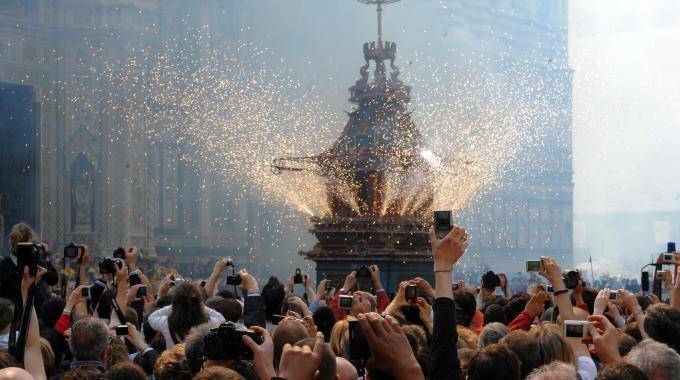 Florence brings Easter in with a bang, literally, and it’s called Lo Scoppio del Carro or The Explosion of the Cart. Every Easter Sunday a 30-foot antique cart pulled by white oxen is paraded from Porta al Prato to Piazza del Duomo where it towers in front of Santa Maria del Fiore. A dove shaped enflamed torch is then launched towards the cart to ignite a fireworks show from the structure. The tradition is held in memorium of a Florentine knight, Pazzino di Ranieri de’ Pazzi who raised a Holy Cross insignia in Jerusalem in the midst of a Crusades battle. As you could imagine, this works up quite an appetite, in fact, do you smell something sweet? That would be fresh frittelle or fried dough pockets. 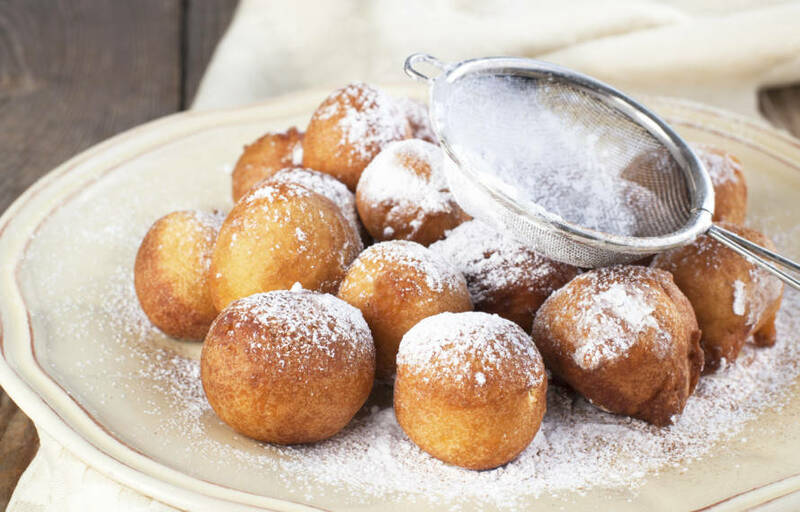 Served steaming hot, these are soft on the inside and sprinkled with fresh sugarcane on the golden brown outside. You can find Italian venders selling them on the street and pay by weight, get full bag sweets for a great price. Rome is home of the largest Holy Week congregations, the Pope hosts Masses beginning from Palm Sunday through to Easter Sunday. For Holy Thursday Pope Francis says Mass in St. Peter's Basilica followed by the Stations of the Cross in the Coliseum that evening. A candlelit Easter Vigil commences at 8:30pm in the Basilica. Mass is said outdoors on Easter Sunday and is witnessed by thousands of Christians in St. Peter's Square followed by the Papal Blessing "Urbi et Orbi," or "to the city and the world." Families and Friends gather together after for a supper of succulent roasted lamb, the flavors of lemon and rosemary resonate through the delicious Easter tradition for the perfect day. Springtime in southern Italy includes temperate weather and meadows of blossoming flowers backed by the crisp blue Bay of Naples. Naples natives embrace time with family and friends. Large picnics and outdoor gatherings commence where pigs are roasted with a salty flavoring and crisp texture on the outside, while being very juicy on the inside. Casatiello is a savory loaf that contains cheese and cured meats like salami and sausage. 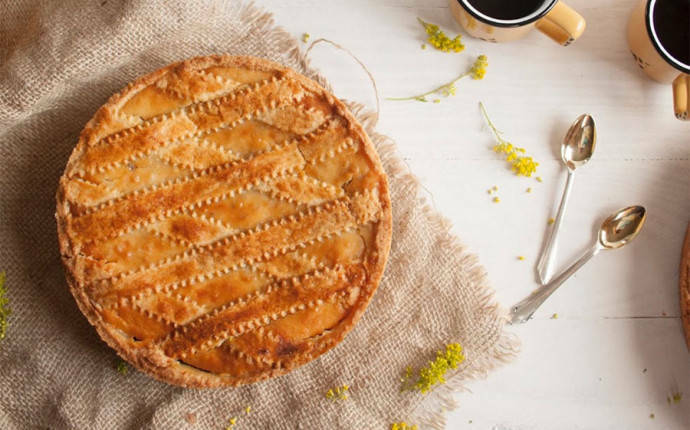 Finish the celebration with Pastiera, a delightful Easter pie swollen with sweet cream and topped with fresh berries and a healthy dosage of powdered sugar. The Abruzzese streets are filled with processions that last from the morning to late at night filled with music, chanting, praying, and lights. 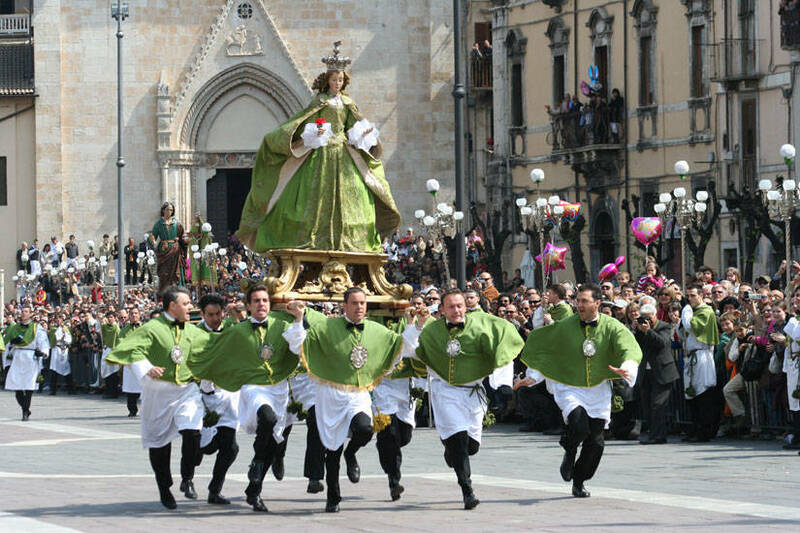 The religious floats are carried through the streets, to preserve the religious traditions some devout Catholics abstain from eating the entire day. Not to worry, the weekend is filled with decadent meats and sweet treats. 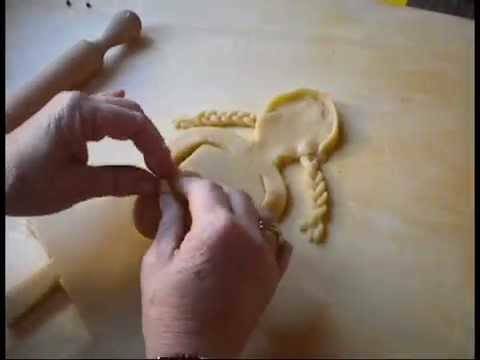 Pupe and Cavallini di Pasqua are cocoa almond cookies that are cut into the shapes dolls (pupe) and cavallini (little horses) that young boys and girls look forward to all year. The island of Sicily flaunts its diversity of traditions around Easter time dating back to its rich cultural past. 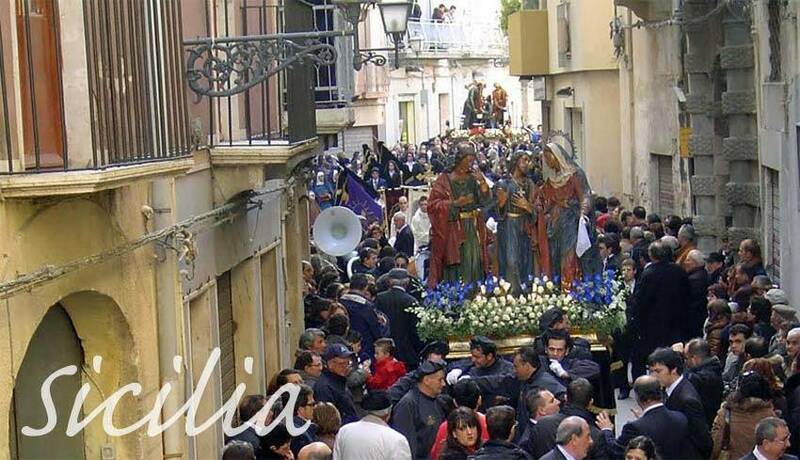 From Good Friday to Pasquetta, the Monday after Easter, the Sicilian streets are lined with religious processions comprised large floats carried by men and women through the cities, some take as many as 16 people to carry safely. Each float is made up of a religios scene: one chariot holds Jesus lying after the Crucifixion and a stutue of the grieving Madonna following him. They are joined by live bands, orchestras, and parades holding candles and ringing bells. 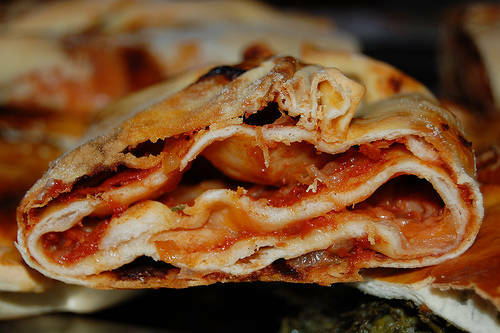 A typical Easter finger food is fresh stuffed bread called Scacce, specific to the Ragusa area. Oozing with flavor, this steaming fresh bread is stuffed with tomato sauce packed with flavors of garlic, olive oil, basil, fresh meat, and lots of cheese that creates a sensation of fresh Easter delight. We hope you enjoyed your Easter trip around Italy! Full of life, flowers, fiends, family, doves, and eggs filled with treats.